Velociraptor ain’t got jack on me! I bought this one for show only. Called the “Civilian”. Presumably made for agents (untrained in blade craft) in the field to use as a last ditch defense. Beautiful G10 handle, feels like linen, almost warm to the touch. Using it for anything outside of self defense voids the warranty. I heard it’s good for harvesting mushrooms. Another collector item: The ‘Q’ model. 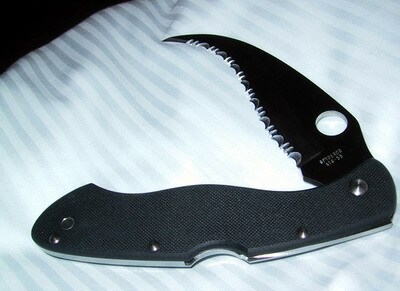 Concept was to make a really light knife by using cutouts in the blade and handle to minimize weight. Picked this up for a song in Shibuya, they go on E-bay for $60, $80, or more. Heard it’s a b*tch to clean after slicing through a big gooey sammich. Time to break down the Japan haul into more bite sized pieces. Let’s start with the Carbon Fiber Cricket. Now, I know I already had a cricket (prior post), but this one has Carbon Fiber scales! Really! The same synthetic material that high performance bicycles are made with! The reason you need this on a knife is because well, it’s obvious, right? OK it looks cool. For some reason, the serrated cricket is the sharpest cardboard slicer I have ever used. The serrations will actually grab hair from your arm. Good thing it’s only a little guy. Time to branch out, away from the typical bowie-style or dirk. Embrace multiculturalism. The Chinese Lum Folder. Sweet imperial jade green, ultimately functional and unassuming looks. Perhaps the perfect folder. Shaving sharp and lightning deployment. I thought that this might truly be the one EDC (every day carry) that will stop this collection madness. At a certain point, the neophyte knife collector will make his first purchase where the user facade is broken. The knife that he knows will never be carried or used. It is only for show, and you have truly turned into the Comic-Book-Guy from the Simpsons with your unread Superman #335 in Mylar bag. Mine was the Stainless Endura, laser etched with Spyder bug and web. Only a Spydernut (or perhaps convicted felon) would think this thing is cool. A lot of production folders are made in Japan. The place is called Seki-city. A traditional sword-making city, there are many quality factories there and a local claim-to-fame. As a result, you can find some deals in the major cities. I found a fairly complete knife shop called “The Edge” in Shibuya (part of Tokyo). I walk into this small store, immediatelyassaulted by wall after wall of production and custom blades. I walk through the wafting cigarette smoke and faint smell of oil and find the Spydercos. Nice older gentleman approaches me. He can see the sweat, sense my uncontrolled palsy. This was when all control was lost and I made multiple acquisitions. I promised myself to only get one. Spring-boarding from the “less is more” concept, and unable to slake my crack-like addiciton of knife collection, I decided to buy a Dragonfly. 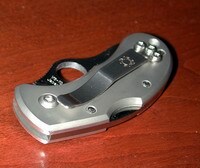 This is a clever little design with an integrated nylon clip. It is the most innocuous (read: non-knife) looking thing sticking out of your pocket. As an added bonus, as the clip is not metal you can safely scrape up against your car and not damage the paint. OK, everyone can make a mistake. I fell off the Spyder-path for my next ultra-small blade, a Kershaw Chive. A nice little “speed-assist” opening knife with a lot of gizmo appeal. I never carry it. It’s not a Spyderco. Plus I’m afraid the darn thing is going to go off in my pocket. Yowch. At this time I also realized that I needed something to sharpen these darn things. 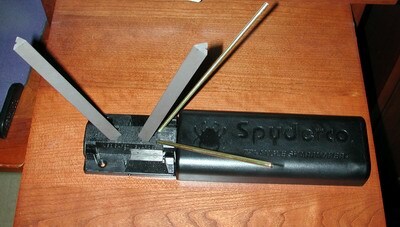 The Spyderco SharpMaker 204 was my answer. Now, I had tried honing before on an Arkansas whetstone, but I never got good at keeping the angles. The Sharpmaker solves all of that with an ingenious V design. Now I was into the small blade scene, and I wanted something more upscale and solid. The FRN Cricket is great, but I wanted something full-metal. The Mouse was my answer. This thing locks up like a tank and has a nice upswept skinner blade, tons of belly. Mythology is the creator actually field-dressed all his deer one hunting season with just a Mouse. The VG-10 blade is scalpel-sharp. Next I decided that that wicked-looking Native would scare too many of the sheeple at my office, so I opted for a smaller blade design, the Cricket. Uses a Reverse-S curve blade that is perfect for grabbing an edge and cutting in on tape, envelope, etc. I liked the Yin-Yang shape. The designer commented that he wanted it to feel like a pebble one would use for skipping on a lake.